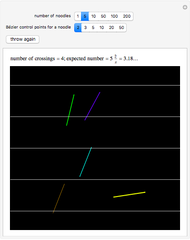 The Buffon noodle problem is an extension of the Buffon needle problem: curves of unit length are dropped randomly onto a plane marked with lines one unit apart. 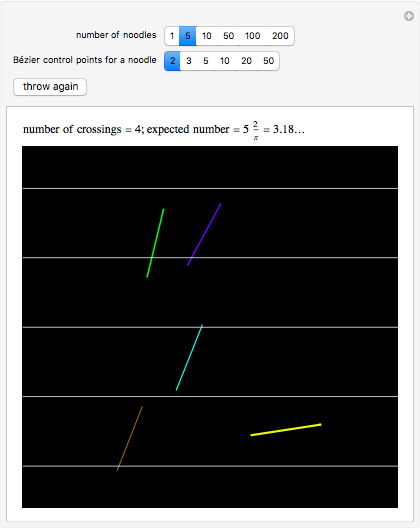 If crossing multiplicities are taken into account (i.e., a noodle crossing a line times contributes to the total crossing count), then the expected number of crossings is , where is the number of noodles thrown. This is the same result as the classic needle problem, where the probability of a crossing is . 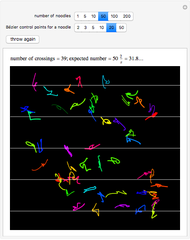 Each noodle is created by using a Bézier curve constructed from random points and then truncating the curve so that its arc length is exactly 1. The proof of the result on the expected number of crossings is not difficult and can be found in the following paper. 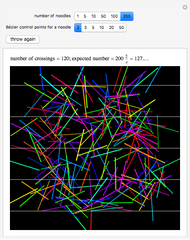 J. F. Ramaley, "Buffon's Noodle Problem," American Mathematical Monthly, 76(8), 1969 pp. 916–918. Stan Wagon "The Buffon Noodle Problem"